I've been a little busy lately (though not as busy soaping as I was on my holidays but that's what happens when you've a full-time job, I guess!) 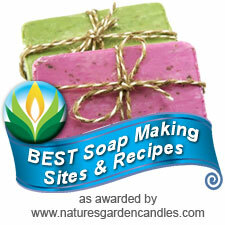 and have made two new soaps and thought I'd show you. 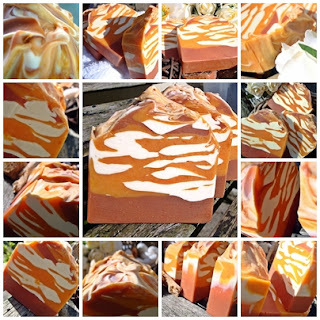 First up is Autumn Rose - she was born because a customer wanted samples of handmade luxury soap to give as small gifts to her clients and asked if I could design a soap for her. She kindly allowed me free reign with the design, choice of colours and fragrance. Initially, we'd thought a wedding-y type soap (as she is a bridal jewellery designer) and I worked with some colours I thought would appeal across the board. But, as we know with soap at times, it can decide to do it's own thing colour wise! I used a new red coloured mica and wanted a deep reddish pink colour as the base... actually it turned out more of a terracotta colour. The pinks, greens and yellows which I wanted to keep light and almost pastel, were lighter than I'd expected. All in all, the soap started out one way and became something else entirely. However, when I unmoulded it, I thought "Autumn!" and, as it the fragrance was rose based, the name "Autumn Rose" just popped into my head. It seemed to fit so well. 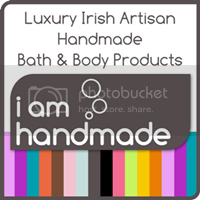 I showed my customer the soap and she loved it, she thought the autumnal colours looked just like a landscape. So I went ahead and cut it into lovely little sample bars and, I must say, they did look so lovely all lined up, looking cute as buttons. The fragrance is described as a soft floral fragrance with top notes of cassis, bergamot and lemon with a floral heart of rose otto, softened by sweet violet on a soothing base is composed of soft woods, amber and musk. It's a soft, delicate fragrance but one that so matches the soaps colours. 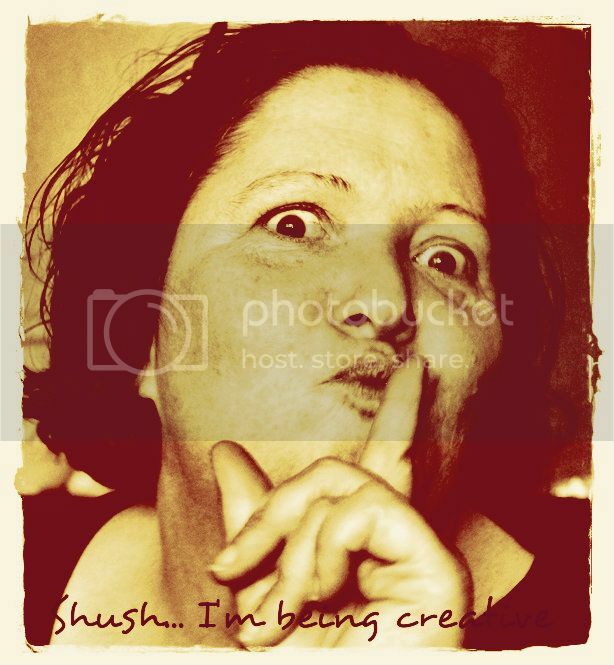 As you can see, it was also my first opportunity to use my new soap stamp which I love!! I need to leave the soap for about 2 - 3 days after cutting and before stamping though, I think, otherwise it'll be too soft and might take some of the soap with it. This was my first attempt! 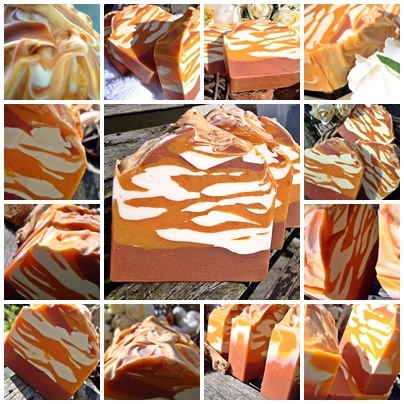 My second soap is an Autumn/Winter version and is called Winter Orange Spice - I wanted to create something extra orangey with a light spice background. It's not a Christmas soap only but one for both seasons at least... but it's so lovely, I'd be happy to use it all year round! It has a blend of Sweet Orange, May Chang (which is a fantastic lemony sherbert essential oil, so fresh and bright and gives a nice background to so many citrus oils) and a little Clove essential oil along with a dash of Cinnamon fragrance oil . It also has fresh orange zest from two HUGE oranges mixed into the orange soap.. this will keep on giving blasts of orange as you use it. 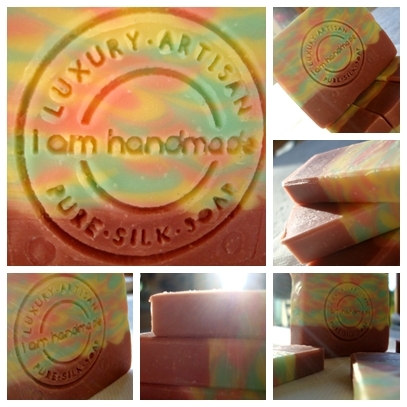 Both soaps are made with Sweet Almond, Golden Olive and Avocado Oil and lots of Cocoa Butter (amongst other oils) and, as always, I used pure wild silk ... I just cannot say enough about what this brings to the final product, it's so lovely, and so luxurious! Both soaps will be available in early October - as Autumn Rose was primarily a custom order, there are only a few of these bars left but, if they're not pre-ordered by the time they're cured, then I'll put them on the site. There are, at the moment, 10 bars of the Winter Orange Spice. I really hope you like these soaps - if you'd like to pre-order either, please do email me at info@soaperstar.com and put one aside for you. Autumn rose really looks like sunset in an autumnal landscape. Beautiful soap. Isn't it funny how soaps behave? I'm so glad your Autumn Rose turned out well, despite it not being exactly as planned. The name fits perfectly! And oh, how I love orange and spice! Heavenly!